I woke as the first light started to filter into the tent, just before 6 am. It had rained during the night but the winds had dried off the tent, and the ground didn't seem to be soaked. After a quiet breakfast of instant coffee and oatmeal, Audun and I packed up our gear and headed out to tackle the final climb to the summit of Mingus Mountain. With all the pushbike that had been foretold, I was surprised when the first section of trail was actually rideable. The grade quickly steepened however, and soon we were pushing our bikes as promised. A quick stop to doctor a heel blister. It was sunny but cool. We were above the desert now and were moving through a forest of oak and fir trees. Brown-orange oak leaves carpeted the ground and their crunch underfoot brought to mind autumn, even though it was late March. The trail traversed around to the north side of the mountain, where we were in shadow and hit the first patches of snow. Scratchy bushes encroached on the trail, and I joked, "This is like the Barkley Maratons - except they don't have to push 25 kg of bicycle up the mountain!" Some sections required the bike to be carried - luckily they didn't last long, that thing was heavy! It took us just over 2 hours to reach the summit of Mingus from the campsite. There was a hang glider launch site on the summit, and campsites complete with picnic tables and an outhouse were sprinkled through the trees, although no water. We stopped for a quick second breakfast of jerky, crackers and gummy candies near the summit. The summit of Mingus Mountain. Although we planned to filter water from the Verde River later that day, we had heard reports that the water could be quite silty and so we decided to check out a small pond marked on our map so we could stock up on extra water if it looked good. Norway is an extremely wet country, and water is never an issue on the mountain trips we take there. For us, it was a challenge to plan ahead and predict how much water we would need. Due to the cool temperatures throughout the trip, we tended to haul too much water. Better overloaded than thirsty I guess! On the way to the pond, we saw a collection of buildings that looked like a summer camp. We started poking around for a spigot when a large man with only one front tooth waddled towards us from one of the outer buildings. 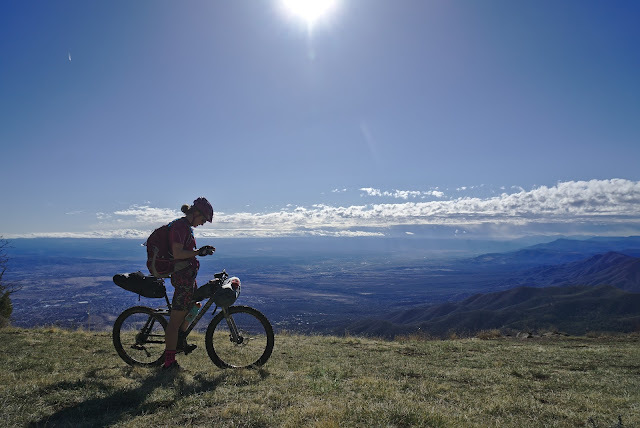 In a continuous stream of words, he began to offer very specific advice about where we could ride nice trails, without once asking us what our plans were. Once we got a word in edgewise, we asked for water and he let us fill our bottles in an indoor sink. "We're the only ones with water on the mountain!" he claimed. You're the only ones on the mountain, I thought. 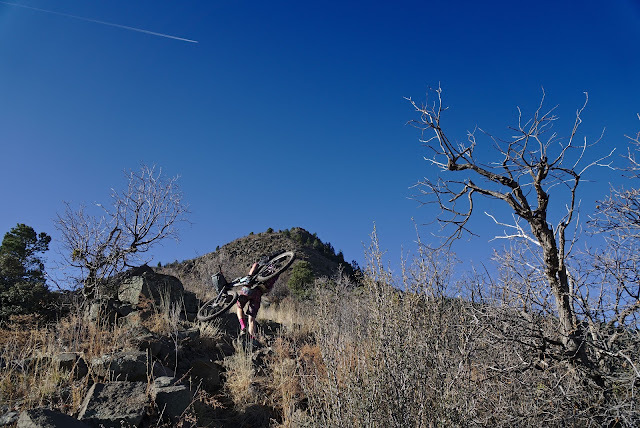 The descent from Mingus Mountain to Yeager Canyon was all fun and games and swooping switchbacks. 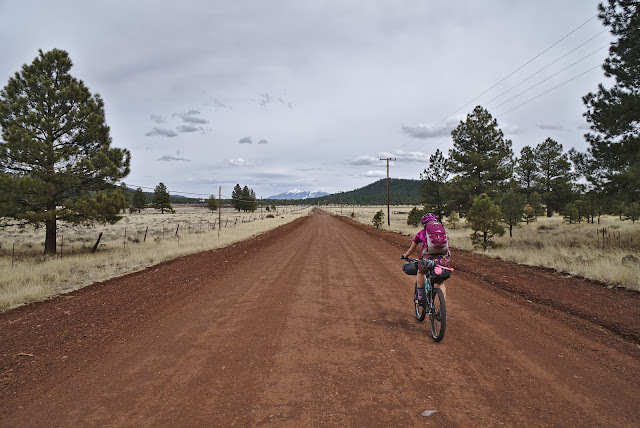 Once we crossed the 89A highway, the fun was over and it was time for a long, hot gravel grind. A rough dirt road undulated through the foothills of the mountains. We followed a buzzing powerline for a ways. An assortment of cattle gazed at us curiously as we pedalled by. Water tanks were placed throughout the landscape, painted with signs like, "Please don't shoot, wildlife and stock water." The bullet holes riddling many road signs attested to the necessity of these markings. We were in cowboy country now. We picked up a slightly more major road which mostly descended, and our pace picked up. Near a cattle guard, we met a couple of farmers looking for some lost cows. They were elderly and curious, and the woman said she had done similar trips on horseback when she was younger. I guess our bikes are our steeds, except that we have to power them ourselves. 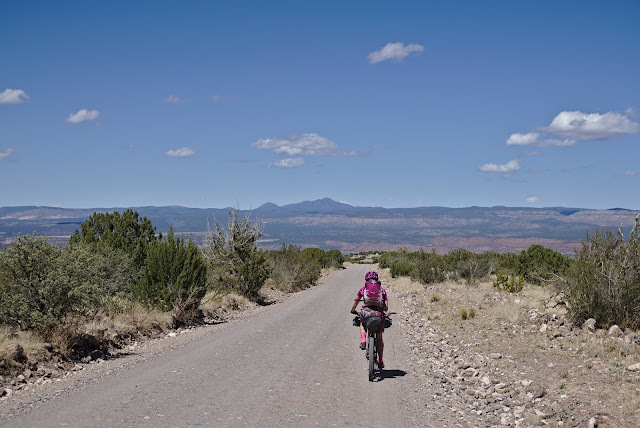 Then we hit a perfectly groomed dirt road and the last miles to the Verde River flew by. 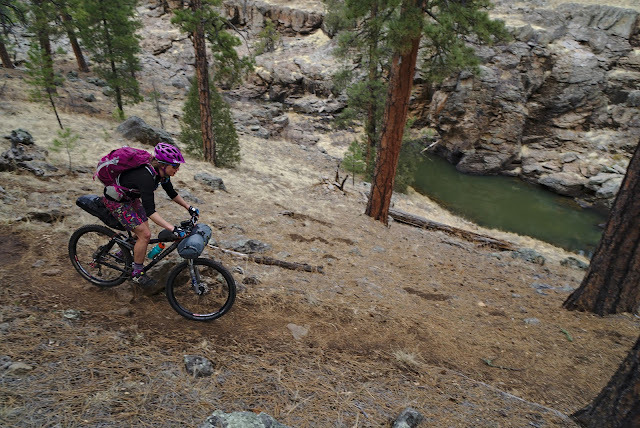 The river water was clear, and we filled up our supplies to maximum capacity before beginning the long grind uphill once again. A hot afternoon on smoother dirt roads near the Verde River. The route climbed for the rest of the afternoon, first on nicely groomed, then on increasingly steep and technical roads. My heavily ladened pack pressed on the small of my back and I gulped down sugary treats to keep my energy levels up. By the time we found a flat stretch of trees in the cool forest at 5:30 pm, we were both exhausted and agreed to call it a day. In retrospect, this afternoon was the most exhausting dirt section, and this was the most tired we felt on the whole trip. The condensation of our breaths had turned to ice on the inside of the tent as I woke to the first rays of light once again. I thought the sun would raise the air temperature quickly and so started riding in shorts despite the low air temps. We were at and would stay above 2000m/6500ft all day, so it never really warmed up. We pedalled fast red roads through the frosty morning towards the outskirts of the town of Williams. I felt creaky and fatigued, typical of day three on a trip like this. As we approached Williams, I knew our toils before resupplying in town were far from over. Two miles outside of Williams, our route veered left off the main road, and we began climbing towards the peak of Bill Williams. Just a smooth morning warm-up before Bill Williams. Even though I knew it was coming, it was disappointing to look up at the huge mountain we had to climb. We followed a trail that would have been mostly rideable on fresh legs without ladened bikes. 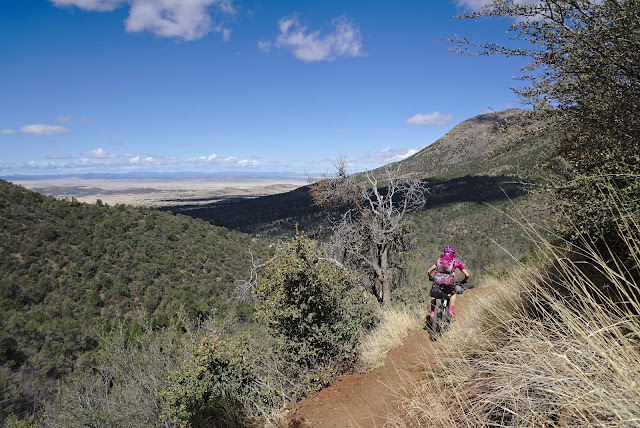 In our current state, we were constantly hopping on and off the bike, varying between short stretches of pedalling and pushing. I felt very out of breath, and couldn't decide if it was the altitude (we were headed to 2700m/9000ft) or the fatigue. It felt like we were crawling up the mountain and that we would never make it up to the top. Relentless forward progress, I told myself, think about that ultrarunning adage. If you just keep moving, you will make it. The face of tired and cranky on the climb up Bill Williams. The climb topped out just below the true summit, and we were too tired to even consider going to the top. I was all ready for another fun downhill, but we had overlooked one little thing. Our route had taken us up the south side of the mountain, and we were headed down the north. All I could do was walk my bike downhill in disappointed silence. We had decided to follow a GPX track we had found online, and follow it we would. This is ridiculous, we are ridiculous, I hate this mountain, I thought. At least this builds massive amounts of character. As if I need more character. In Williams, I raided the local Safeway and came out with blueberry Pop-Tarts, more energy bars, crunchy chickpeas, almonds, crackers, pepperoni and, inevitably, more water. It was hard not to buy more. Then we went by the local Mexican joint and snarfed down extremely greasy quesadillas and burritos. We sat outside, partially to keep an eye on our bikes but also so we could take our shoes and socks off and air out our toes. Because we're classy like that. 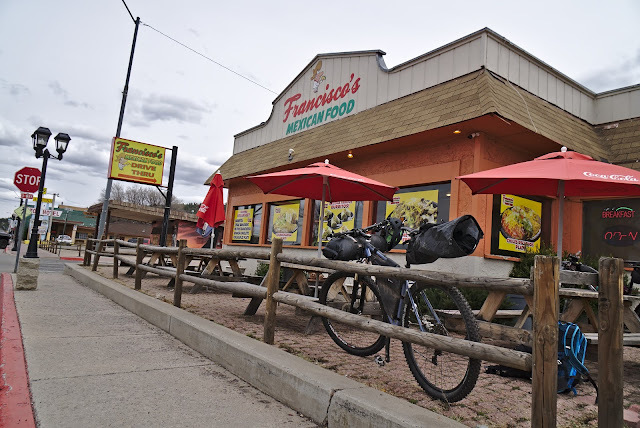 Francisco's Mexican Food in Williams. Not exactly fine dining. The route lead us our of Williams via the main road, which clearly on Route 66 and proud of it. All of the shops were old-timey American and there was an excessive number of motels for such a small town. I felt fresher from the break, but then became sleepy and felt weighed down by all the grease I had consumed. More red gravel outside of Williams. After some easy dirt miles, we veered off to ride trails through Sycamore Canyon. The views from the rim were magnificent. 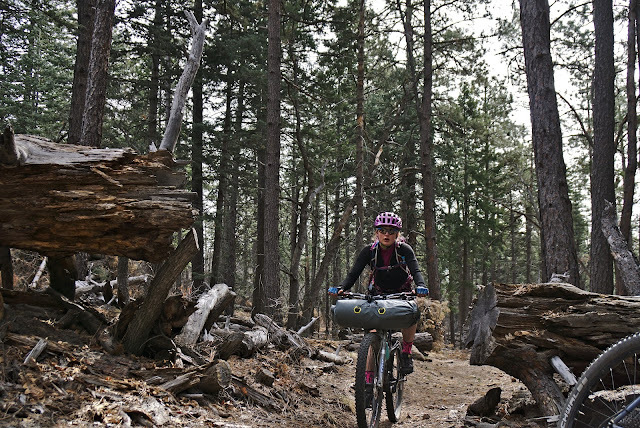 The trail here was part smooth and enjoyable, part littered with technical, rocky riding. I was full and queasy and was irritable. Audun finally coaxed some sugar into me despite protests and I felt better. Lesson: never stop eating. Smooth riding in Sycamore Canyon. It wasn't all like this. We exited the trail onto more roads, and pedalled past a bunch of ranches bearing Trump supporter signs. 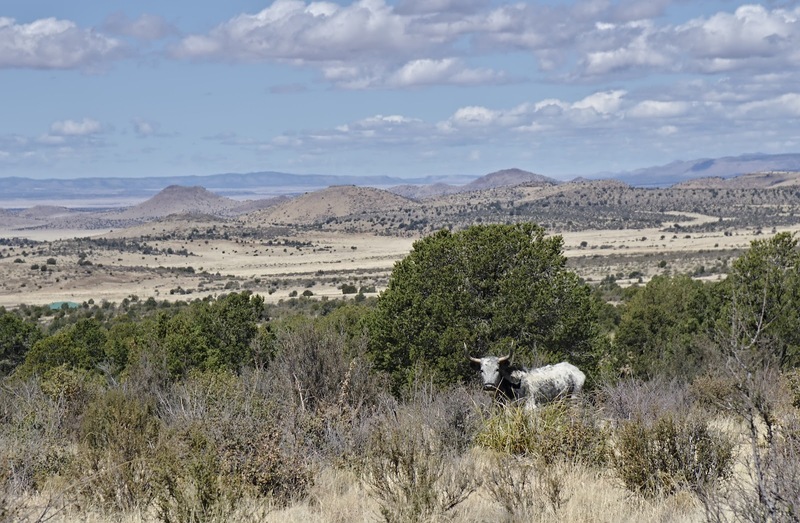 Each ranch had its own road and they were clearly allowed to name them themselves, resulting in some odd ones like 'Dog Haven' and 'Cloud Nine'. The road veered back into the National Forest and we found a quiet campsite on a meadow. Late afternoon on Garland Prairie Road. We were living the simple lives of bikepackers: sleep, ride, eat, repeat. Three days down, and two to go.